There are a wide variety of knife blade styles that you will find on a pocket knife. Below is a complete list of the twelve most commonly seen styles. Any one of them will make a great knife, but it is important that you pick a style that suits the type of work you will be doing with the knife instead of just picking the coolest looking one. Clip Point – With a cupped edge on one side and a sharp blade that comes to a fine tip, the clip point pocket knife is a great everyday tool. However, the tip of the blade does have a tendency to be fragile, which can cause the knife to be damaged when used with excessive force. Drop Point – A drop point blade is curved on both sides, one sharp and one flat. The pointed end makes this type of blade is a good choice for hunters. Hawkbill – Imagine a hawk’s bill and you will see what the shape of a hawkbill blade. This is a good choice to keep in a tool box, as it is helpful in tasks where other blades fail. 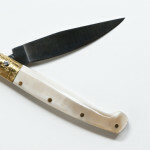 The hawkbill blade is also attractive to collectors who wish to keep their knives on display. Needle Point – Just as the name suggests, a needle point blade comes to a small, sharp point. A needle point blade is rarely found in pocket knives as it does not have a great deal of utilitarian use. Needle point knives are best for collectors who want unique blades. 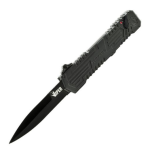 Pen Knife – A pen knife is perfect for small tasks. This blade has the same shape as a drop point, but is much smaller and easier to control. Sheepsfoot – The relatively dull sheepsfoot blade is a good choice for those who need a blade that requires a great deal of strength for cutting. The blade can be used for slicing, but the dull point is not ideal for piercing. A sheepsfoot blade is not for hunters, but more for those involved in hiking or other sporting activities in which a blade might be necessary. Spear Point – Much like the drop point blade, the spear point has two curved sides that reach a point. However, while the drop point has a thick belly that allows for a strong grip, the spear point is much thinner, which makes it more fragile. Spey Knife – The spey knife has a flat back with a curved blade that rises in a flat edge. This is a strong blade that is often included with multi-blade knives. Straight Back – This type of blade is best for those who wish to have an all-purpose knife that will not see excessive use. The straight back pocket knife has an unsharpened, straight edge and a curved blade that can be used for cutting or sawing. Tanto Point – An interesting blade for collectors, the tanto point knife has a flat-edged point. This makes the blade better able to withstand a great deal of pressure, leading to less damage of the blade itself. Trailing Point – A deeply curved backside leads to a fine point on the trailing point blade. This is a good show knife, but should be used with care as it is extremely fragile. Wharncliffe – The wharncliffe is an extremely sturdy blade that is perfect for tasks that require a great deal of pressure. The wharncliffe blade is sharp on the straight side with a curved back. The blade itself is thick and not easily damaged.